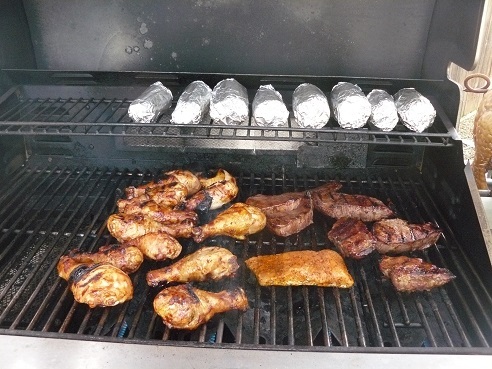 Fourth of July Food is traditionally a Barbeque or a Picnic! Tips!! Our celebrations have changed little over the decades. 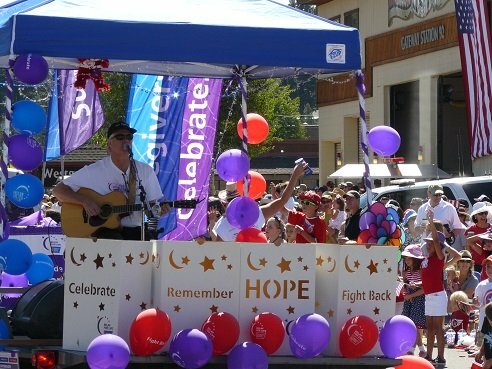 We start our day with parades, and end them with barbeques, picnics, and fireworks galore! Our celebrations center on traditional foods that remind us of our heritage! What most of us eat! 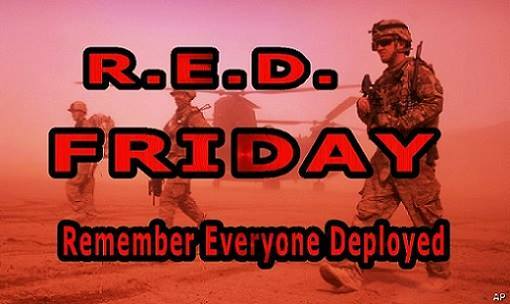 Burgers, Hot Dogs, or Fried or Barbecued Chicken! Apple Pie, or a cake decorated in theme! Can’t get much more American than that! 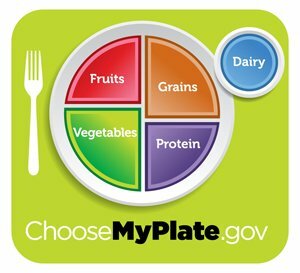 With the new “My Plate Guidelines” out in 2012, (shown above), we could make a few adjustments to make our meal more health friendly. Our goal would be to limit our grain and protein choices to one fourth of our plate each, and fill our plate half full of fruits and veggies! Varied Fruit plate with lots of red and blue fruits - see our Produce Trays page for some tips in making a tray. There are lots of Red, White, and Blue Fruits and Veggies you can choose! Dessert of Choice - I just did a great lightened dessert for our Mom's birthday. I picked up an Angel Food cake, and I sliced up some strawberries and had some blueberries and a little whipped cream. 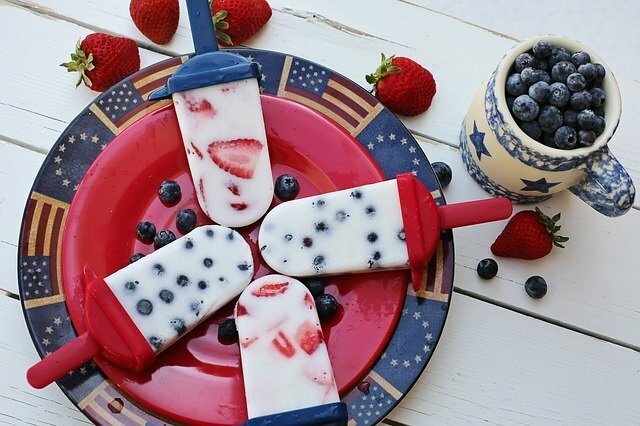 Red, White, and Blue, and not a ton of calories! Dessert might seem over the top, but the "Fourth of July", is a holiday, and celebrations call for Dessert! 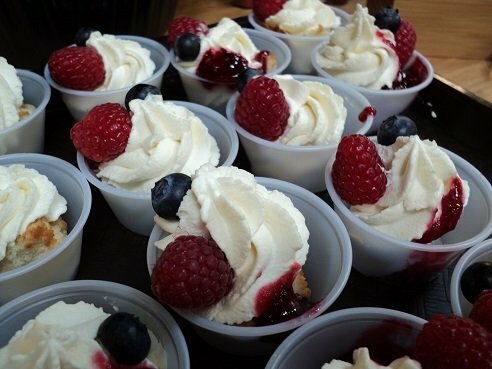 If you have a large number of people to serve, for a great dessert, you can just do a small serving plastic bowl (easy cleanup!) with a small slice of angel food or pound cake at the bottom, then a scoop of vanilla ice cream or whipped cream. 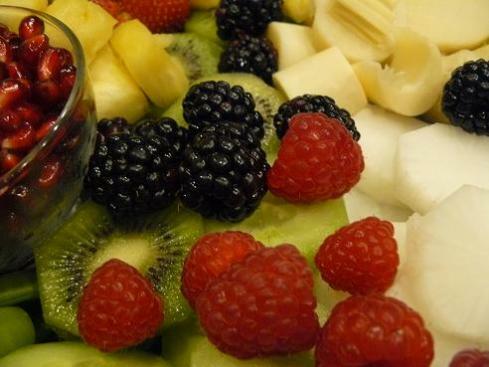 The fruit pictured above shows raspberries and blueberries, but strawberries would be awesome to add in too! Another great Fourth of July dessert idea, would be to make the above Fourth of July Strawberries, that I saw on Pinterest. This would be fun to have your kids or grandkids make, if you have them. You just melt some white chocolate in your microwave and dip about two thirds of the strawberries, then dip the bottom half of the white chocolate area in blue sprinkles and put them on some wax paper to dry! 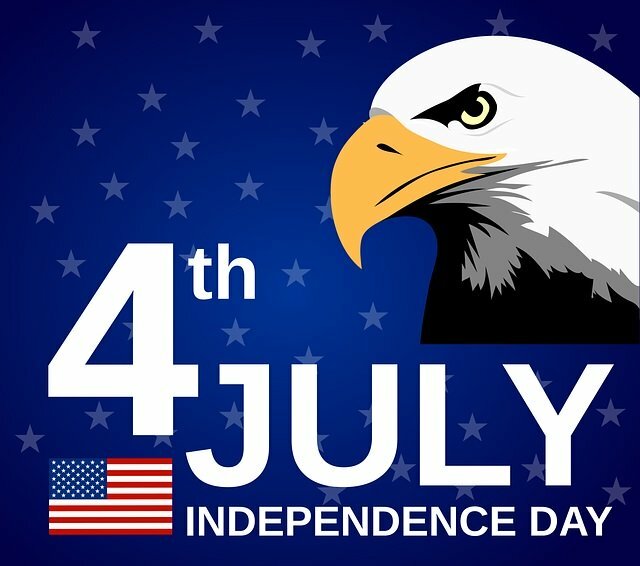 Please Follow our Holidays and Observances Fourth of July Food - Holiday Board on Pinterest - below you will see our 30 most recent pins to this photo board!